Renowned as the world leader in waxing technologies, Lycon wax allows for quick application, extra strong grip and no skin drag or sticky residue. The result is that Lycon treatment is comparatively less painful than strip waxing, and hair as short as 1mm can be removed. This wax is a complementary blend of natural aromatherapy ingredients, where the specially chosen conditioning and therapy oils allow for total comfort and satisfaction. For over 130 years, electrolysis has been & remains the only recognized 100% permanent hair removal method. This technique permanently destroys germinative cells responsible for hair growth, thanks to the insertion of a fine probe in the hair follicle & the application of a current adjusted to the type of hair & the area to be treated. We have now upgraded our Apilus 500 to the medical grade Apilus Platinum Pure using 27 MHz radio frequency. This hi-tech & high speed system is very comfortable - there really is only a tingle not a bee sting & with virtually no skin reaction! Seriously, you would never know that you are having needle electrolysis! The Apilus Platinum Pure works twice as fast as any other epilator by optimizing energy concentration in the hair follicle. The number of treatments needed to obtain complete & permanent results is, on average, 25% less than usual. Moreover, the Platinum Pure can effectively treat any hair or skin colour. Electrolysis treatments with the Apilus Platinum ultrarapid epilator will always deliver maximum results. We provide a complimentary consultation to assess the area & explain the treatment to you. Apilus Platinum Pure Hair Removal Minimum up to 8 minutes. Apilus Platinum Pure Thread Vein Removal for Face Thread veins, also known as dilated capillaries, broken veins, spider veins or red veins, can be successfully treated using an advanced technique to quarterise the minute capillaries, so they dry up & disappear. Approx 3-6 sessions subject to the clients needs. £15 booking fee for consultation redeemable against first treatment on same day only. Apilus Platinum Pure Skin Tags These little excesses of skin are usually found around the neck, armpits, groin, under the bust & on eyelids but can grow anywhere. They are easily treated. The number of sessions depends on size & quantity to be treated. Apilus Platinum Pure Milia Removal Milia are small, raised, pearly-white or yellowish bumps on the skin. They are most often seen under the skin around the cheeks, nose, eye lash line & eyelids, forehead and chest but they can occur anywhere on the body. They are quickly & easily treated. The number of sessions depends upon the quantity and area to be treated. The Ellipse IPL system is used very effectively for the treatment of a wide range of skin conditions; including Permanent Hair Reduction, Facial Thread Vein Removal, Skin Rejuvenation (removal of sun damage & pigmentation) & Acne Clearance treatments. Ellipse gives great results without the pain & discomfort associated with other more traditional methods of hair removal. 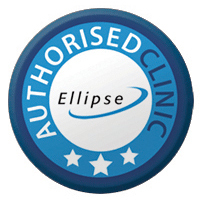 Best of all, Ellipse's clinically tested procedure is safe, gentle, fast and effective. - redeemable against course price. Thread Veins, Skin Rejuvenation & Acne Treatment We offer Ellipse Intense Pulse Light for skin rejuvenation & thread vein removal perfect for anyone with problems such as sun-damage skin, pigmentation spot, age spots, acne, acne scarring or thread veins. We recommend a course of 4-6 treatments - we have had some amazing results. IPL courses available pay for 5 get 6th free (paid in advance).